Another of my fetishes is a love of all small electronic gadgets, namely cameras. I just can't pass up a good deal on a camera and there's nothing I love more than taking a new camera out of the box, or using a new lens, and taking a few hundred photos in a place I haven't been before. Here's the rundown. The top two are the same, I bought the first one on Woot.com right after Kodak filed for bankruptcy protection. The second one I bought because they put it up a couple weeks later at a lower price with more accessories so of course I wanted another one. The ones underneath are a Lumix and a Leica. They are pretty much the same but the Leica has a GPS inside. The one on the bottom right is my go to video camera. It's compact and fits into my pocket easily and has a front light. 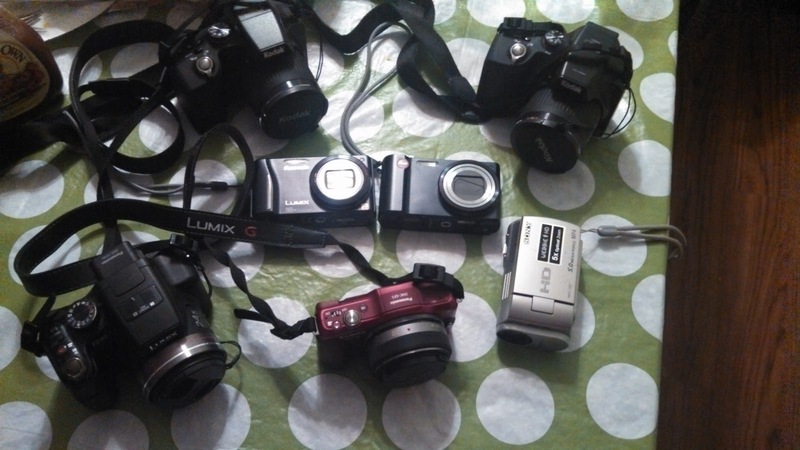 On the bottom left is my high zoom Lumix. I can stand across the parking lot at the home depot and take a picture of the whole store and then zoom in to see the doors. That's the one that I use to watch the neighbors. Just kidding most of the neighbors are policemen and that's a great way to get arrested or beaten. I actually use the high zoom because I'm too lazy to walk across the parking lot to take pictures. The one in the bottom on the middle is my crown jewel, a micro 4/3. It has a pancake lens on it right now but I have a super zoom lens and a standard zoom. The super zoom is 7-14 inches long depending on how zoomed it is but is looks kind of silly at the end of such a small camera. It's totally awesome though and it gets some great shots. Whenever I'm around town I have a camera on my neck, I love when I catch something that's unusual or interesting and I don't see anyone else taking photos. Sunday morning seems to by the prime time as I've caught a St. Patrick's day 5K, complete with green grass skirts and green wigs, Easter morning at the local Catholic church. Four weeks ago I took some photos of a guy named "diamond" and his girlfriend with rainbow hair at the park and they told me about some deer they saw in the woods behind the park. So if you see a guy with a camera taking a picture of squirrels in the cemetery or the pile of boxes behind Costco, say hello, it's probably me. Cool! It's great any time of year. Thanks for stopping by! If I hadn't started writing, I believe I would have taken up photography. I'm fascinated by it. I am not very good at it but I'm practicing! I love photography, although I'm pretty crap at it myself, luckily my brother and my family take great photos so I mostly rely on them. You have some great photos on your blog. I'm really just a beginner and have just learned what F stop and shutter speed and all that mean. I'm excited to learn more and see what I can come up with in the future though. You cracked me up when you said you watched the neighbors, too funny. I also love cameras but when I bought my last nice one I put about 3 of the old ones one ebay and they sold fast. Thank for stopping by my blog, I have followed you so I can keep with your A to Z blogs also. Haha we had a belated Easter egg hunt with the neighbor, he just got promoted to detective. I told him he has a mention on my blog now.